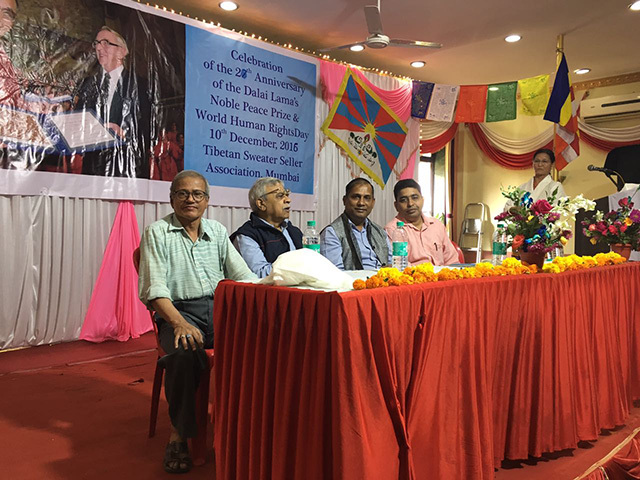 December 10, 2016: Friends of Tibet Campaigners – CA Kallianpur, Dinesh Tiwari, Baldeo Pandey and Rohit Singh at Mumbai Human Rights Day event venue. The event was jointly organised by Mumbai Tibetan Sweater Seller's Association and Friends of Tibet. Mumbai, Maharashtra: Universal Human Rights Day 2016 was observed at Sharda Hall, Dadar, Mumbai on December 10, 2016. The day also marks the 27th Anniversary of His Holiness the XIV Dalai Lama being awarded the Nobel Peace Prize. The event was jointly organised by Mumbai Tibetan Sweater Seller's Association and Friends of Tibet. Dinesh Tiwari, Addl DIG, Special Services Bureau was the Chief Guest for the day and Baldev Pandey presided over. Friends of Tibet Campaigners CA Kallianpur and Rohit Singh presided over the event. The programme started with Tibetan Prayer for the long life of His Holiness the XIV Dalai Lama followed by Tibetan National Anthem. The Chief Guest and the audience offered Traditional Tibetan Khata to the photograph of His Holiness the Dalai Lama. Rohit Singh welcomed the audience and spoke about the struggles faced day-to-day by people in Tibet against the illegal occupation of the China. He emphasised that the Tibetans living in occupied Tibet have a lot of hope on the Tibetans in exile and we should not break their hope. He further spoke about the struggle faced by Indians two generations back to liberate India from the British, and that the struggle continues to build the country and that our responsibility towards Tibet would never cease. He said that there is no country in the world which has not faced threat or challenge; crisis gives birth to leaders and he invoked the Tibetans among audience to become one. Dinesh Tiwari, Addl DIG, Special Services Bureau shared his experience of working with Tibetans and spending considerable duration of his work life in the Himalayas. He remembered his experience of meeting His Holiness the XIV Dalai Lama and visiting Bomdila in Arunachal Pradesh where the Dalai Lama spent his first night in India, upon coming here seeking refuge. He opined that the Tibetan community is very lucky to have a leader in His Holiness and stressed that the spirit of Tibet, the culture should be preserved and continued to be practiced and the struggle for an Independent Tibet should never end till achieved. Baldeo Pandey, former Friends of Tibet Campaigner spoke about how he started his association with Tibetans during his early days of his career in Chandigarh. He shared his experience of working with Tibet Support Groups the last 18 years and stressed that the support groups were just a medium but his intention was always been to work for Independence of Tibet. He stressed that to him Tibet was not just a piece of land, but rather it is the civilisation and culture and more than everything, a neighbouring country with whom India had always shared peaceful relationship. He spoke about the Tibetan History wherein Tibet has defeated China and Tibet has all the calibre to be a free nation. He expressed his desire when he tried to put his feet across the border when in Nathula Pass, but the soldiers rushed to stop him asking what he was doing, to which he said that he was performing a pilgrimage – touching the soil of Tibet is a pilgrimage. When he heard a Chinese soldier shouting, he replied ‘this is Tibet'. He shared the story of Bhagat Singh, who died at a very young age. He could have saved his life by apologising to the British, but he chose death, rather than a life of slavery. He insisted that the Tibetans need many Bhagat Singhs and each Tibetan needs to be one. Baldeo Pandey spoke about the Israeli population living in the west prayed every day that one day they would be in Jerusalem. They longed to go back to Jerusalem, a place which is nothing but a desert. He ranted that the need of the hour for the Tibetans in exile is not to become western, but to educate themselves, and their aim is not to be live in US or Canada but to be in Lhasa, and if at all they chant any manta, then it should be ‘One Day in Lhasa'! CA Kallianpur, Advisory Board, Friends of Tibet spoke about his being a supporter of the Tibet cause for the last 30 years and shared his experience of not being able to attend a programme in Delhi where he was supposed to speak about the Tibet Cause. Later he got the speech published in a community magazine which was read by a retired diplomat and this resulted in the change of stand of Government of India after a few months. Rohit Singh thanked all speakers and reminded that food and water is available even in Prison, but we should not forget our nation, Tibet is in flames and we should not forget the fact Tibetans inside Tibet have a high hope on Tibetans living in exile. He shared a storyline of a film he watched – a group of five women soldiers fighting a German paratrooper unit, which had landed on the edge of a creek. They lost life and when the commandant of the unit asked one woman why they sacrificed their life to defend a creek, the woman replied it's not about the creek, it's about their motherland Russia which was behind them. Traditional Tibetan songs and dance followed and the programme ended with lunch.